"What's unique about this plastic is the ability to stick itself back together with a drop of water," said Melik Demirel, professor of engineering science and mechanics, Penn State. "There are other materials that are self healing, but not with water." Demirel and his team looked at the ring teeth of squid collected around the world—in the Mediterranean, Atlantic, near Hawaii, Argentina and the Sea of Japan—and found that proteins with self-healing properties are ubiquitous. However, as they note in a recent issue of Scientific Reports, "the yield of this proteinaceous material from natural sources is low (about 1 gram of squid ring teeth protein from 5 kilograms of squid) and the composition of native material varies between squid species." So as not to deplete squid populations, and to have a uniform material, the researchers used biotechnology to create the proteins in bacteria. The polymer can then either be molded using heat or cast by solvent evaporation. The two-part material is a copolymer consisting of an amorphous segment that is soft and a more structured molecular architecture. The structured portion consists of strands of amino acids connected by hydrogen bonds to form a twisted and/or pleated sheet. 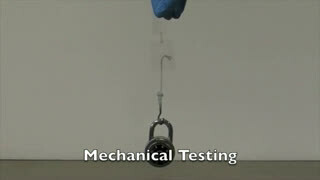 This part also provides strength for the polymer, but the amorphous segment provides the self-healing. 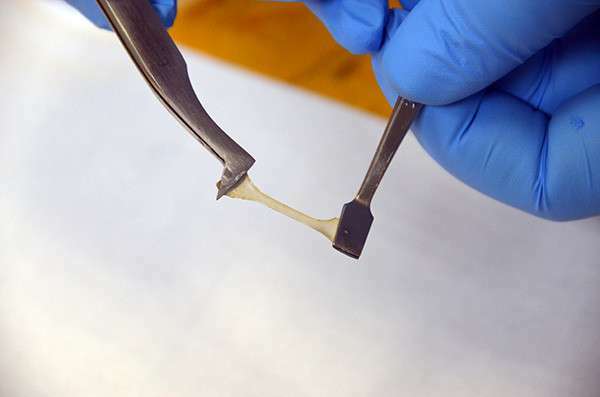 The researchers created a dog-bone shaped sample of the polymer and then cut it in half. Using warm water at about 113 degrees Fahrenheit—slightly warmer than body temperature—and a slight amount of pressure with a metal tool, the two halves reunited to reform the dog-bone shape. Strength tests showed that the material after healing was as strong as when originally created. "If one of the fiber-optic cables under the ocean breaks, the only way to fix it is to replace it," said Demirel. "With this material, it would be possible to heal the cable and go on with operation, saving time and money. "Maybe someday we could apply this approach to healing of wounds or other applications," he said. "It would be interesting in the long run to see if we could promote wound healing this way so that is where I'm going to focus now."